Hope 2014 has gotten off to a good start! I have some exciting news to share with you. Also, mark your calendar for our upcoming performance at Typhooon! I am very excited to announce that an article about my music is published in the prestigious DOWNBEAT Magazine (February 2014 issue), written by well-renowned jazz critic Kirk Silsbee. It is a tremendous honor, and I want to give thanks to everyone who supports our band, as well as ACJO members for their contribution to make every performance an awesome musical experience. Click to read this article! Celebrating the Year of the Horse!! 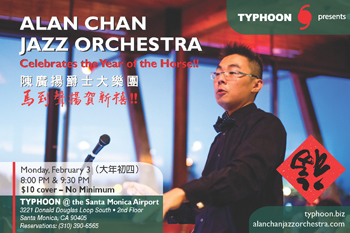 Alan Chan Jazz Orchestra has been invited to return to TYPHOON at the Santa Monica Airport to present a 2-set concert celebrating the Chinese New Year! 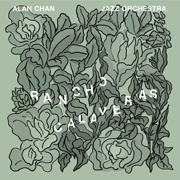 Besides tunes from my recently released Rancho Calaveras EP, there will be a sneak peak of music from the upcoming full album and more, with splendid orchestration and intriguing stories. Reserve your seats now over the phone at (310) 390-6565. 12/2013 - NotacÃ­a de Dec.
10/2013 - NotacÃ­a de Oct. Copyright Â© 2014 Alan Chan Music, All rights reserved.